Natural, simple health conscience items originating from Livingston Farms core products: Grass Fed Beef, Pure Maple Syrup, Peppermint and Spearmint Oils. All items are made with 5 ingredients or less. Most are only made with 2 or 3 ingredients. Please email livingstonatural@gmail.com with any questions or to place an order. 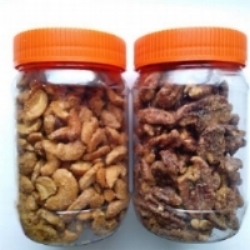 Maple Roasted Cashews, Spicy Cashews, Almonds, Pecans, Cinnamon Pecans or Mixed Nuts. Available in 8 oz ($8) or 16 oz ($12) containers. Larger quantities available upon prepaid order and request. Note: Cashews may have been previously roasted in peanut oil. Please specify if you have an allergy and other raw cashews will be used instead. All other nuts used are raw. To maintain freshness, store in a cool, dry place. Maple Almond Roasted Granola (with or without raisins). Available in 16 oz containers ($6). Larger quantities available upon request. Maple Cream available in 8 oz ($10) jars. Larger quantities available upon prepaid order and request. Keep refrigerated. Peanut Butter or Sunflower Butter Fudge available in 8-9 oz containers ($10). Larger quantities available upon request. 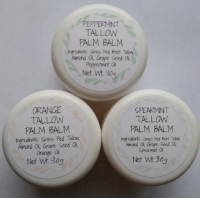 Made with Grass Fed Beef Tallow, Almond Oil, Grape Seed Oil and All Natural Scented Oils. Rub onto hands or feet or massage into skin. To soften, warm briefly. To prolong shelf life, refrigerate when not in frequent use. Not intended for human consumption. 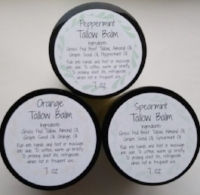 This makes grass fed tallow highly skin compatible, allowing it to absorb easily into the skin to improve the protective barrier function of the skin, prevent moisture loss and regenerate the appearance of healthy, youthful looking skin. Pure grass fed tallow contains the same kinds of fatty acids that are found naturally in youthful, healthy looking skin. These are both found in the protective outer layer of the skin and in sebum. These fatty acids have moisturising, softening, regenerative and anti-inflammatory properties. Stearic acid improves skin’s suppleness and flexibility, aiding with damage repair and barrier function. Oleic acid (Omega 9) also helps the other active components penetrate deeply into the skin. Has anti-inflammatory and antimicrobial properties. Is the most active anti-microbial found in our sebum. Palmitoleic acid is also a basic building block of our skin, but it’s production declines with age. Aids with smoothing the appearance of skin and helps to improve barrier protection. It’s production in skin also declines with age. AN OPTIMAL BALANCE OF ESSENTIAL FATTY ACIDS, ALPHA-LINOLENIC (OMEGA 3) AND LINOLEIC ACIDS (OMEGA 6), IN A RATIO OF ALMOST 1:1.